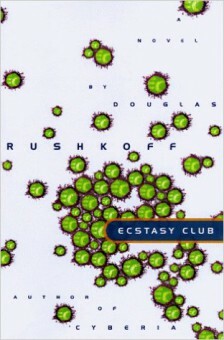 Buy Ecstasy Club on AmazonBuy Ecstasy Club on Barnes & NobleBuy Ecstasy Clubon iTunesBuy Ecstasy Clubon BAM! When the young, hypertalented idealists who call themselves Ecstasy Club find an abandoned piano factory in Oakland, they make it the focus of a round-the-clock rave the likes of which the Bay Area has never seen before. They also make the factory a base camp in their search for a method of time travel that combines computer wizardry, esoteric spirituality and mind-altering substances. The club’s mesmeric leader, Duncan, and the story’s resourceful narrator, Zach, actually manage to “break time” online, only to discover that an unsettling array of characters has beaten them to it. Government agents, corporate saboteurs, religious zealots and even the local cops are suddenly out to get the club. As they battle an ingeniously conceived conspiracy (think Thomas Pynchon meets The X-Files), Zach battles his own growing affection for Duncan’s lover, Lauren, and begins to wonder whether enlightenment is all it’s cracked up to be.